Renovated in 2010, this charming hotel is built in a style traditional for the Bodrum area and features 3 small, low-rise blocks, painted white and with bright pink bougainvillea growing against the walls. 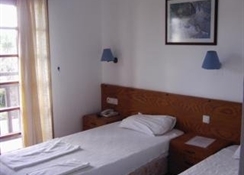 There are 24 rooms and facilities on offer to guests at this air-conditioned establishment include a lobby area with a 24-hour reception and check-out service, a hotel safe and a currency exchange facility. There is a bar and a restaurant and guests have WLAN Internet access at their disposal. They can also take advantage of the car parking facilities available if arriving by car. 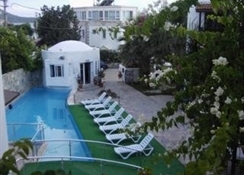 LocationThis hotel lies in close proximity to Bitez Beach (70 m). Guests will find local transport within 100 m of the hotel, including services to the smaller resorts on the Bodrum peninsula as well as Bodrum and Gumbet. The nearest bars and restaurants are roughly 2 to 3 minutes walk away. 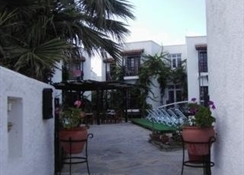 The hotel is approximately 4 km from Gumbet, 6 km from the Oasis Centre and its shops, 6.5 km from the mausoleum and 7 km from the cosmopolitan resort of Bodrum. 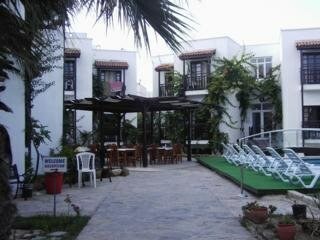 Turgutreis weekly market can be enjoyed just 11 km from the hotel and Bodrum Airport is 45 km away. 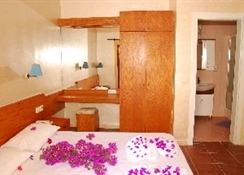 RoomsThe rooms are furnished in a simple but pretty style. 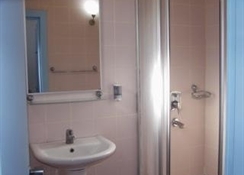 All come with a private bathroom with a shower and a hairdryer and offer a double or twin beds. They are equipped with a direct dial telephone, Internet access and a safe. Furthermore, individually regulated air conditioning and either a balcony or terrace feature in all accommodation as standard. SportThis hotel features an outdoor swimming pool with a poolside snack bar accessed by a small bridge over the pool and guests can also relax on the sun terrace with its sun loungers and parasols. The local beach has many water sports available, including jet skiing, windsurfing, sailing and scuba diving (fees apply to all). Water sports fans can also go waterskiing (charges apply), motor boating (charges apply), canoeing (for an additional fee) and pedal boating (charges apply). Moreover, the sandy beach offers sun loungers and parasols for hire. MealsBreakfast is served in a buffet style and lunch and dinner are available as a set menu. PaymentMasterCard and VISA are accepted at this hotel.